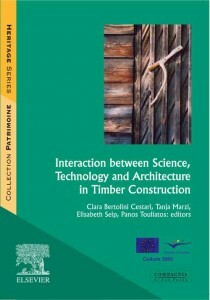 Interaction between Science, Technology and Architecture in Timber Construction – I.A.M. The theme of the relationship between science, architecture and technology, developed during international meetings, has been faced with different interpretations. A common point is the basic aspect of the problem: the concept of unity of the process realised in the recovery of architecture, therefore the necessity to join theoretical and scientific knowledge, constructive operativity, technological innovation and reasons of the contest, in brief, culture and construction. The book was produced with the belief that there is still a lot to do in the subject of the diffusion of results of our scientific researchers and our knowledge of mechanism of alterations that afflicts wooden architectural heritage and their problems of restoration. This is the third book of a series promoted in the frame of the EU Culture 2000 Project Wooden Handwork/Wooden Carpentry: European Restoration Sites. As the previous volumes, the book tries to apply the results of the research for the training of different professions in the field of cultural heritage, historians, technologists, dendrochronologists, architects and engineers, as well as craftsmen. Planners, technologists, university researchers, National Board of Antiquities, present in this book a wide scenery on the theme of wooden constructions.